MHQ Truck Is Gearing Up For A Big Move! 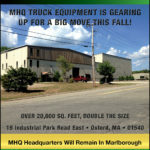 MHQ Truck Equipment will be moving to 19 Industrial Park Road East in Oxford, MA this fall! We are very excited to be moving into our new location that is double the size of our Shrewsbury branch. Stay tuned for more updates.